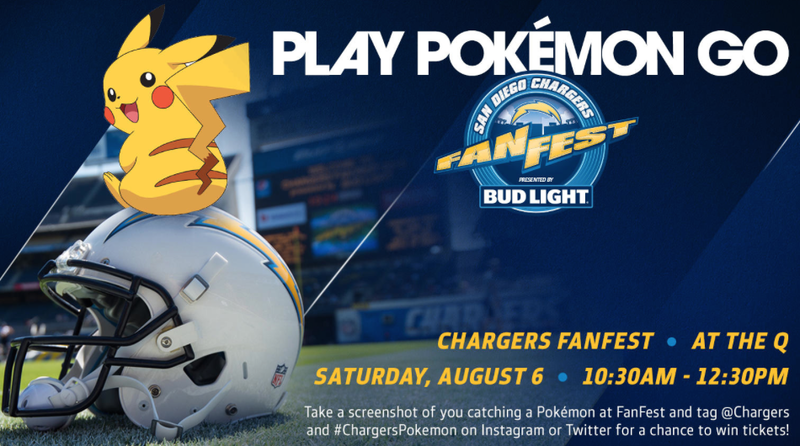 The San Diego Chargers are adding an exciting virtual-world element to their annual FanFest on Saturday by hosting a Pokémon GO Meet-Up (www.Chargers.com/Pokémon) at Qualcomm Stadium. Parking and Admission to FanFest, presented by Bud Light, as well as the Pokémon GO Meet-Up are FREE. The parking lot will open for fans at 9 a.m. and the stadium gates will open at 9:30. Pokémon GO players will be able to chase the virtual Pokémon on the lower concourse and outside of the stadium’s gate areas. The field and the upper levels of the stadium are closed to Pokémon GO players. Fans who participate in the Pokémon GO Meet-Up will have a chance to win great prizes, including preseason game tickets and autographed Chargers merchandise. To be eligible to win a prize, Pokémon players must screen-capture themselves capturing Pokémon in the stadium with the tag @Chargers and then upload the image to either Twitter or Instagram, using the hashtag #ChargersPokémon. Screen-shots must be taken in the Augmented Reality (AR) mode and include a recognizable element of Chargers FanFest. 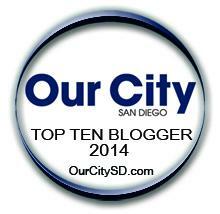 The contest will run all day Saturday (Aug. 6, 2016). Winners will be selected at random from those that qualify and announced on Monday on Chargers.com. For more information about Saturday’s Pokémon GO meetup, fans can visit http://www.Chargers.com/Pokémon. FanFest will also mark the debut of the 2016 Charger Girls. They will perform on the field at approximately 10:15 am. In keeping with the Pokémon GO theme, the Charger Girls will perform while wearing Pikachu hats. Pikachu is the official mascot of the Pokémon GO game. FanFest 2016 is being presented by Bud Light. In addition to the Pokémon GO Meet-Up, there will be plenty to do for fans of all ages. From 9:30-10:30 a.m., a number of Chargers alumni will be stationed on the plaza concourse at Gates A, D and G signing autographs for fans. A few of the former Chargers greats scheduled to attend include Luis Castillo, Stephen Cooper, Raylee Johnson, Darren Carrington, Billy Ray Smith and Ed White. At 10:15 a.m., the action shifts to the field with the debut of the 2016 Charger Girls. The Chargers will take the field for a full-pad practice where fans will see their favorite players, including Philip Rivers, Antonio Gates, Keenan Allen and Jason Verrett. Fans attending FanFest also will see the best season seats available for the 2016 season tagged for the annual Select-A-Seat Day. Fans interested in looking at season-ticket options can access the stadium through the Chargers Ticket Office at Gate C at the stadium starting at 9 a.m. Every fan who becomes a new Season Ticket Member at FanFest will receive a free Chargers replica micro-helmet and 2016 Chargers Yearbook (one per account). Single-game tickets to all 10 home games also will be on sale. Fans should bring an appetite to FanFest as hot dogs and soft drinks will be available for just $2 apiece. Also, some of the newest Chargers merchandise and apparel, including jerseys, hats and t-shirts, will be available at the Chargers Team Store at Gate G. Every fan who spends at least $50 anywhere inside the stadium during FanFest will receive a 2016 Chargers Yearbook as a gift. Many of the entertainers who are at the stadium on game days will also be in attendance at FanFest and fans will have an opportunity to get their faces painted and receive temporary tattoos among other fan-friendly opportunities on the Plaza level concourse between Gates A and C.
Fans can find more information on FanFest by visiting http://www.Chargers.com or calling 858-874-4500. The Contest is in no way sponsored, endorsed or administered, or associated with, Pokémon Company International, Inc. Nintendo Co., Ltd. or Niantic, Inc. Pokémon and Pokémon character names are trademarks of Nintendo.